Henry Charles Fox was born in London on 1 March 1855 to a merchant banker and died in 1929 in Horsham, Sussex, having lived most of his life in Kingston-upon-Thames. He travelled widely across the south of England, observing and painting in Surrey, Berkshire, Kent and Sussex, as is apparent from his body of work, some of which is available to view online @ http://www.artnet.com/artists/henry+charles-fox/past-auction-results. During his lifetime English rural life changed out of all recognition, but Fox tried to capture the idealised dream of the perfect English countryside as it was during Victorian times with his delicate watercolour landscapes. His paintings were many and provide us with a beautiful record of life as it was at the turn of the century. A prolific artist, he became well-established by the early 1900s and had exhibited over 20 paintings at the Royal Academy by 1913, having had his first one accepted in 1880 at the age of 25. His reputation spread throughout the provinces and he exhibited in such prestigious galleries and exhibitions as the Royal Scottish Academy, Royal Society of British Artists, Royal Hibernian Academy, Glasgow Institute of Fine Arts, Royal Institute of Painters in Watercolours and Manchester City Art Gallery. A well-respected artist, Henry Charles Fox was elected a full member of the Royal Society of British Artists (RBA) in 1889. The following year he exhibited a total of 113 paintings there. Although specialising in his preferred medium, watercolour, Fox also painted in oil and produced many large etchings, using as his subject rural scenes, depicting farm animals and ordinary farm workers engaged in their daily toil, much as did the Dutch genre artists. His paintings were very popular in the early 1900s, possibly because of their tranquillity in a world embarking on the industrial revolution, and in fact are still highly collectable today. The three examples of Fox’s work currently resting in the Lytham St Annes Collection are all beautiful watercolour rural landscapes and are typical of his work. The first one called Sheep at a Roadside, signed and dated 1910 or possibly 16, was donated by Mrs Ann Jane Haigh of West Beach, Lytham in 1948. The scene is a very peaceful one of a flock of sheep straying from the road to graze in the thick grass or possibly heading for a gate on the right hand side hidden by the brambly bushes. They are followed by the shepherd with his crook over his shoulder. 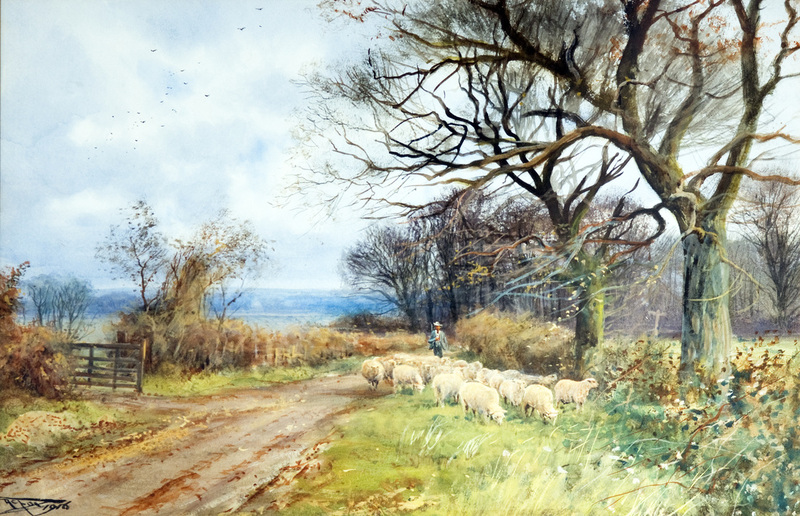 The second picture, A Lane Near Guildford, was donated by Mrs Margaret Jessie Gourlay, also a resident of Lytham, in 1955. This work depicts a cart with two horses and a driver on a country lane passing cottages on the left and approaching the viewer. A River Landscape near Windsor. Further clarification is required. In all these works the elements of the shallow and the deep picture planes interact as the pictures carry the eye from the foreground, which in one shows the gate, the road, the sheep with their shepherd and the large foreground trees and, in another, the horses drawing the cart past some trees and cottages deep into the flat landscapes to the plains in the distance. In the third picture the eye is carried down the river into the distance where a castle is set against the skyline. However, attention returns to the riverbank along which a horse is being led by a farmer. All the pictures are carefully and skilfully balanced with the dynamic lines running straight from the bottom corners, with the lanes and the line of the hedge in one and the streams in the others, to the centrally placed focal points, which are the shepherd, the cart and the horse being led. Each painting, with its well worked out perspective, has a good solid triangle formed by these elements on which it rests. The static lines of the far horizons and the distant trees on the right in Sheep at a Roadside gives the picture a feeling of stability and peace. The artist has used a painterly technique, allowing the soft edges of the bushes and hedges and the foliage of the tall trees to blend into the picture without the use of hard linear brushstrokes. Fox uses the earthy colours of the genre painters’ palette with the soft reds of the horses’ blankets and the splash in the river and bushes blending with the browns, greens and ochres to give the paintings a warm and peaceful feeling under the large skies. His skilful use of toning and light, worked into the shadows in the grass and the foliage of the trees and bushes, creates a feeling of airiness and a lightness of mood. The tones used on the lanes give them a strong textural feel of ruts and stones, as well as emphasising the dynamic properties of the lanes. The water sparkles with plenty of white showing through the paint, adding to the light aspect. The patterns of the clouds in the large expanses of sky throw the trees into dramatic silhouettes, the lines of which take the eye deep into each of the pictures all the way to the distant horizons.